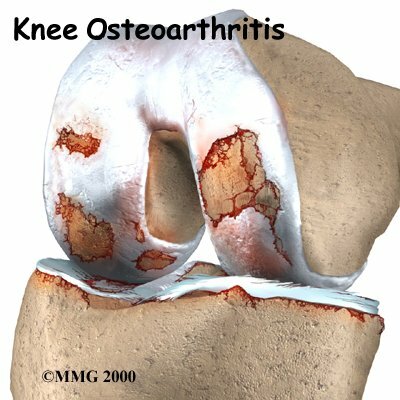 Welcome to Barkman & Smith Physical Therapy's patient resource about Osteoarthritis of the Knee. Osteoarthritis (OA) is a common problem for many people after middle age. 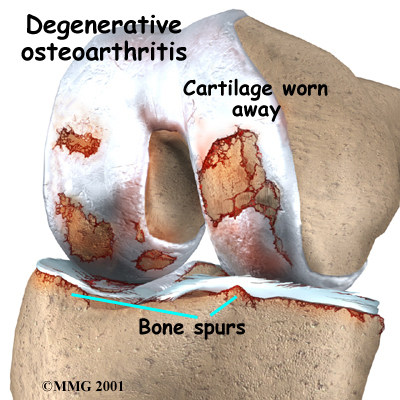 OA is sometimes referred to as degenerative, or wear and tear, arthritis. OA commonly affects the knee joint. In fact, knee OA is the most common cause of disability in North America. In the past, people were led to believe that nothing could be done for their problem. Now there are many ways health professionals like Physical Therapists can treat knee OA so patients have less pain, better movement, and enhanced quality of life. When you visit, Barkman & Smith Physical Therapy, our Physical Therapist will take a history and do a physical exam. The diagnosis of OA can usually be made on the basis of the initial history and examination. OA can't be cured, but Physical Therapies are available to ease symptoms and to slow down the degeneration. Recent information shows that mild cases of knee OA may be maintained and in some cases improved without surgery. Patients may also want to consult with their doctor or pharmacist regarding the use of pain relief or over-the counter anti-inflammatory medication. Acetaminophen (Tylenol) is a mild pain reliever with few side effects. Some people may also get relief of pain with anti-inflammatory medication, such as ibuprofen and aspirin. Talk to your doctor or pharmacist if you have questions or concerns regarding these medications. 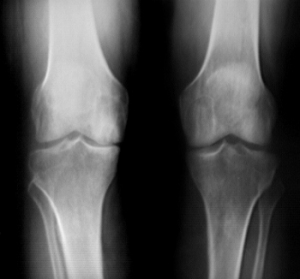 Medical studies have shown that glucosamine and chondroitin sulfate can also help people with knee OA. These supplements seem to have nearly the same benefits as anti-inflammatory medicine with fewer side affects. Many therapists feel the research supports these supplements and are encouraging their patients to use them. We begin by recommending ways to calm pain and symptoms, which might include the use of rest, heat, or topical rubs. 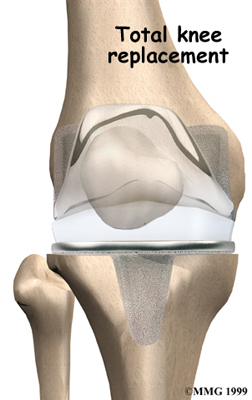 Our Physical Therapists then teach patients how to protect the arthritic knee joint. This starts with tips on choosing activities that minimize impact and twisting forces on the knee. People who modify their activities can actually slow down the effects of knee OA. For instance, people who normally jog might decide to walk, bike, or swim to reduce impact on their knee joint. Sports that require jumping and quick starts and stops may need to be altered or discontinued to protect the knee joint. Our Physical Therapist may suggest that shock-absorbing insoles placed in your shoes to reduce impact and protect the joint. In advanced cases of knee OA, or when the knee is especially painful, we may recommend a cane or walker to ease joint pressure when walking. People who walk regularly are encouraged to choose a soft walking surface, such as a cinder or grass track. For mild cases of knee OA, our Physical Therapist may give you a heel wedge to wear in your shoe. By tilting the heel, the wedge alters the way your knee lines up, which works like the unloading brace mentioned above to take pressure off the arthritic part of the knee. We will use range-of-motion and stretching exercises to improve your knee motion. Our Physical Therapist will also show you strengthening exercises for the hip and knee to help steady you knee and give additional joint protection from shock and stress. People with knee OA who have strong leg muscles have fewer symptoms and prolong the life of their knee joint. Your Physical Therapist will also suggest tips for getting your tasks done with less strain on the joint. Your Physical Therapy treatments usually begin the next day after surgery. Our first few rehabilitation sessions are used to ease pain and swelling, help you begin gentle knee motion and thigh tightening exercises, and get you up and walking safely. You may need to use either a walker or crutches after surgery. We may instruct some patients to limit how much weight they place on the knee for about four to six weeks. After going home from the hospital, a Physical Therapist may see you for a short period of home therapy before beginning outpatient Physical Therapy. Our outpatient treatments are designed to improve knee range of motion and strength and to safely progress your ability to walk and do daily activities. At Barkman & Smith Physical Therapy, our goal is to help you keep your pain under control, maximize knee mobility, and improve muscle strength and control. When your recovery is well under way, regular visits to our office will end. Although we will continue to be a resource, you will be in charge of doing your exercises as part of an ongoing home program. Your physician may prescribe medicine to help control your pain. Acetaminophen (Tylenol) is a mild pain reliever with few side effects. Some people may also get relief of pain with anti-inflammatory medication, such as ibuprofen and aspirin. Newer anti-inflammatory medicines called COX-2 inhibitors show promising results and don't cause as much stomach upset and other intestinal problems. 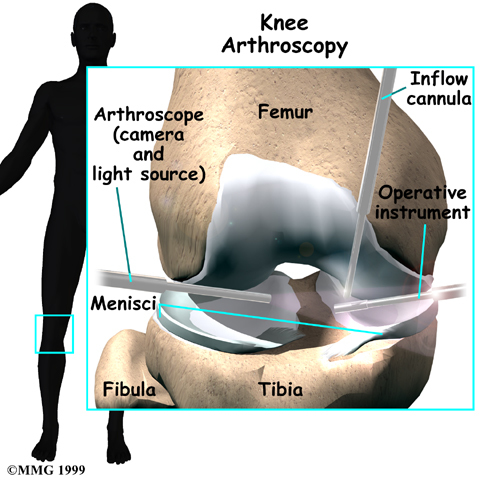 Surgeons can use an arthroscope (mentioned earlier) to check the condition of the articular cartilage. 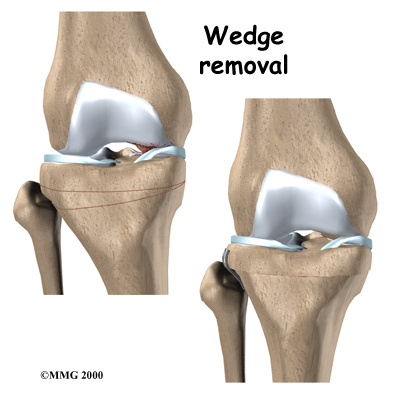 They can also clean the joint by removing loose fragments of cartilage. People have reported relief when doctors simply flush the joint with saline solution. A burring tool may be used to roughen spots on the cartilage that are badly worn. 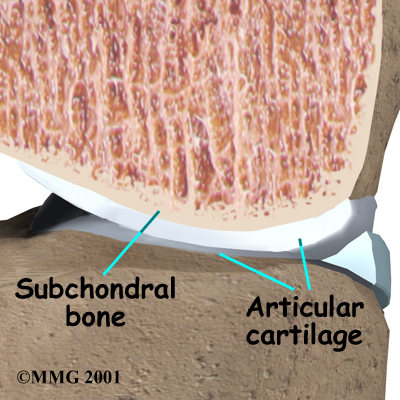 This promotes growth of new cartilage called fibrocartilage, which is like scar tissue. This procedure is often helpful for temporary relief of symptoms for up to two years.